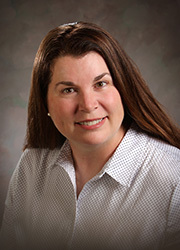 Kobi earned her bachelor’s degree from the University of Wisconsin Madison Physician Assistant Program in 1983. She is nationally certified by the National Commission on Certification of Physician Assistants, and is professionally licensed by the state of Wisconsin. Kobi is a member of the American Academy of Physician Assistants, Wisconsin Academy of Physician Assistants, and Physician Assistants in Oncology. She has years of experience working in cardio-thoracic surgery, orthopedic surgery, and most recently Radiation Oncology. Kobi is a breast cancer survivor herself, and has a special interest in treating other women with breast cancer. Kobi and her husband, Patrick, are both natives of Wisconsin. Patrick also works in the medical field as a Perfusionist in cardiac surgery. Kobi and her husband have traveled to third world countries doing mission work. They have two young sons, Riley and Ryan. They enjoy family, traveling, fitness, sports, reading and music.